Your wedding photographs may just be one of the most important investments you will ever make. This is because long after your ceremony and reception have come and gone, you and your spouse will be able to cherish the photographs of these events as a tangible reminder of your most wonderful day. If you are in midst of planning your wedding, you may find yourself feeling overwhelmed by all of the details to navigate. But while all of the decisions feel so important now, the experts remind brides and grooms that after the big day has come and gone, over the years some of the finer points may fade and blend into one big haze. That’s where your wedding album can take center stage. It can retell the story of your day and immortalize the highlights on every single page. If money is tight and you are trying to decide where to splurge and where to save, remember that you can easily forego the couture gown for a budget-friendly dress, go for chicken over steak, and skip the band in favor of a DJ and none of these sacrifices are likely to impact the outcome of your day either way. But if you hire an inexperienced or unreliable wedding photographer who doesn’t get the results you want, you will probably end up forever regretting this irrevocable mistake. In the past, the process of selecting a wedding photographer was much easier since most people wanted their wedding photographs to look the same. But today, the options that exist when it comes to wedding photography can span quite a wide range. Whether you want mainly posed formal shots or candid close-ups of all aspects of the day in more of a journalistic format, you can find someone who specializes in mastering this approach. In addition, you may want vibrant photos that have a very contemporary look, or instead prefer the more classic feel that you get with black and white or colorized shots. The bottom line is that whatever you want, there is a wedding photographer out there who can accomplish it. You may just have to do some research to find exactly the right fit. How much are you willing to pay to capture those priceless memories of your big day? Wedding photographers can be very expensive if they are experienced, have top of the line equipment and can provide the portfolio and references to prove they are worth every penny of what they charge. While you should never shop on price alone for this important aspect, you also do need to have an idea of what you can afford to help you narrow your search. If you’ve allocated $1,000 for this element, you don’t want to meet with wedding photographers whose packages are in the $10,000 range if you won’t be able to come up with the additional money to pay for their best work. But on the other hand, the wedding photographers in your budget may not have the caliber of equipment they would need to meet your expectations. The best way to bridge this gap may be to look at a range of wedding photographers who are in or moderately above your range to see your choices and determine whether it’s worth it to you to splurge a little. You may find if you cut back in other areas, you can come up with more than you had originally thought. Some of the ways to find local wedding photographers to consider include doing a search online for those who work in your region, asking your wedding venue for references, visiting local bridal shows where wedding photographers display their work and asking friends to recommend who they used. In addition, you can find local wedding photographers through some highly respected professional organizations including the Wedding Photojournalists Association and Professional Photographers of America. Ideally, you will want to find a wedding photographer with whom you have a real chemistry. This will ensure the best results from your photos. When you find a few wedding photographers whom you are considering, be prepared to meet with them and view their wedding portfolios and find out what style they prefer and if this is in keeping with your vision. Also ask how they get their shots. Highly experienced wedding photographers are usually good at blending into the background as they follow you and your guests around. If you are hiring a studio that has multiple wedding photographers on staff, make sure that you know who will be assigned to your wedding and make a point to meet with that person to ensure you have the right connection to work well together. Also check references to reinforce that your instincts are correct. Finally, if you do find a wedding photographer you like very much but you aren’t quite ready to commit, you may want to use him or her for your engagement photos to see if you have the right chemistry. Some wedding photographers will be willing to add this engagement session to your wedding package if you like the results and end up booking them for everything. When meeting with wedding photographers, there are some key questions to ask that can help you to make your decision. For instance, you will want to know if they offer a package deal, what it costs and what will be included in the price. Generally, you can expect the wedding photographer to cover your ceremony and some or all of your reception. In addition, you may arrange for photographs of the wedding party, engagement photos and bridal portraits before the big day comes. If you want to add, or take away, any of these elements, the price may change accordingly. This might even offer you some type of leeway in coming up with a package that works within your budget and meets your needs. In addition, you will want to find out how many wedding photographs are included in the final contract (usually it is at least 120 or more, but can vary from place to place) and also how much it will be to order additional prints. This is essential because if additional prints are very expensive, you may find the overall price is much more than you expected. Further, you should ask if you will be able to keep your negatives. Many photographers keep the rights to them, which means you will have to go through them to order additional prints. This is standard practice but you need to know upfront since it does affect how much you will pay in the end. Other things to consider include what type of equipment the person will use, whether they will have an assistant with them and the turnaround time you can expect to get the proofs and then to receive the prints you select. 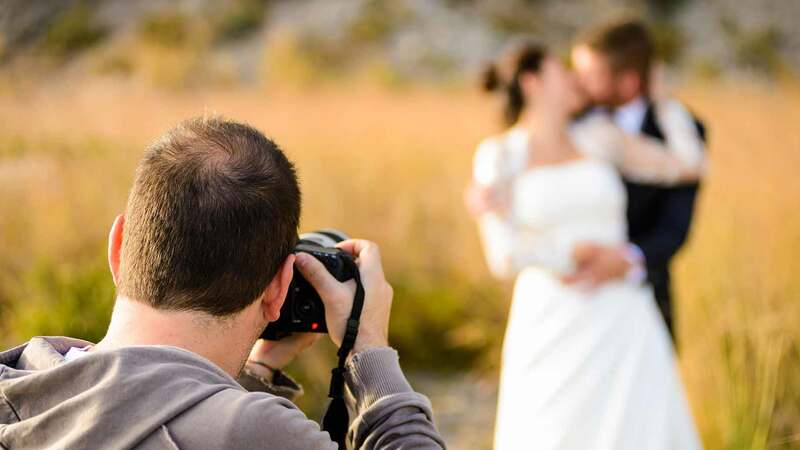 The cost for a wedding photographer can vary a great deal, depending on the formality of your wedding, time of year and level of photography expertise and equipment you are getting. Just as you can plan a wedding that costs a few thousand on up to a hundred thousand or more, so can you find a wedding photographer for every budget. Some wedding planners suggest that you allocate between 10 and 25 percent of your overall budget to photography, but again, all couples are different on what they are willing to spend. Generally, wedding photographers can charge in the $250 to $500 an hour price range, with a typical wedding taking about four to six hours of a photographer’s time. If you think this sound pricey, keep in mind that for every hour of time spent on the job, there can be another several hours of behind-the-scenes work involved in preparing for your big day and then processing the prints. In addition, professional photography equipment is a substantial cost that a good wedding photographer invests in regularly to keep-up-to date. Other expenses a wedding photographer has to account for include carrying insurance (which is required by many event venues) and advertising their services. When you add all of this into the equation, plus weigh in the experience, artistic ability and training the person brings to each assignment, you will suddenly realize that the hourly rate isn’t so outrageous. With wedding photography packages that can cost anywhere from about $1,000 to $10,000 or more from which to select, it is worth noting that many couples spend somewhere in the range of about $2,000 to $5,000 on this endeavor. If you want to find out more about selecting a wedding photographer, there are a variety of online resources that can help you provide information that may help you to make your decision. For instance, the Wedding Channel and Wedding Photo USA both provide directories of wedding photographers you can search to find professionals in your area, as well as advice on what to look for and what to expect. In addition, wedding sites like the Knot, Martha Stewart Weddings and Frugal Bride can be valuable sources of advice and information about hiring wedding photographers and other aspects of planning your big day. Some brides and grooms provide disposable cameras on their reception tables so their guests can take photographs throughout the event. While this can be a nice touch to allow your guests to participate on a more intimate level in your wedding, and can also provide a host of informal photos you may not get from a professional, the experts warn that it is usually not a wise choice to count on these alone. The quality of the disposable cameras and the expertise of your guests just won’t compare to what you can expect from a trained wedding photographer. Therefore, if there is any way you can swing the expense of hiring an expert to capture your big day, it will be well worth it in the end.